Team owner George Preston Marshall could hold out no longer, black players were coming to the Redskins, but who expected Ernie Davis and Bobby Mitchell? Curly R's special series on the history of RFK Stadium continues. There is evidence the Kennedy administration maintained contact with the Redskins even after the advent of black players on the team in December 1961. In January of 1962, players and coaches involved in the new collegiate US Bowl were treated to a tour of FBI headquarters and met briefly with Attorney General Robert Kennedy. Among the guests for this event: Redskins head coach Bill McPeak, the coach of the East squad, and newly signed Redskins rookie Ron Hatcher, the first black player to sign with the team. Later, in December 1963, Redskins players would haul presents at a Christmas benefit for needy kids attended by Bobby Kennedy. Between these two events, the Redskins would improve, playing their best football in five years, averaging forty-one thousand attendance per game and a 5-7-2 record in 1962. Despite falling to 3-11 in 1963, attendance at DC Stadium continued to climb, up to forty-five thousand. It was in this time that the legacy of Interior Secretary Stewart Udall was established: The man that forced final integration of the NFL using the power of the federal government to force private enterprise to adopt policies of equality through the use, or withholding, of public facilities. Secretary Udall's story was not done here though, he and DC Stadium would come together once more in history. After 1963, integration faded as a football issue in Washington, DC. Between 1964 and 1968, many players that would bridge the Redskins from the integration period into the modern era were brought to the team: Bobby Mitchell, Sonny Jurgenson, Sam Huff, Charley Taylor, Paul Krause, Len Hauss, Chris Hanburger. 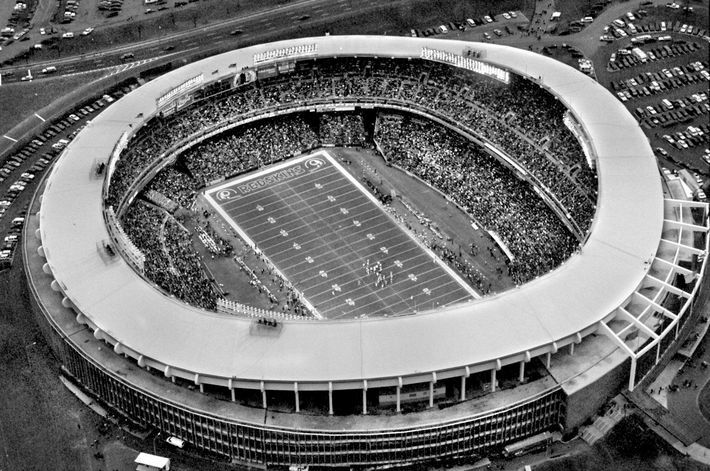 Attendance continued to rise at DC Stadium: Nearly forty-nine thousand per game in 1964; nearly fifty thousand in 1965 and 1966; cresting fifty thousand in 1967 and 1968, the year the Redskins streak of sellout games officially started, the streak is still alive today at over 350 games. In June of 1968, Bobby Kennedy, then a Democratic Senator from New York, was assassinated in Los Angeles, thrusting the Redskins back into a political fray. Following the assassination of his brother the president in November 1963, Bobby had stayed on as Attorney General for nine months before resigning to run for Senator in New York. As President, John Kennedy was succeeded by his Vice President, Lyndon Johnson. Tensions between Johnson and the Kennedys were legend. Many of the Kennedy hands resigned before the end of President Johnson's abbreviated term, or were not reappointed when Johnson won the presidential election of 1964. One Kennedy appointee that did stay through the full Johnson administration was Interior Secretary Stewart Udall. A staunch Kennedy ally, Udall administered his department capably while defending it from political encroachment by a famously strong-willed and self-congratulatory Johnson. It was during Johnson's full term in office that discussions began on the possibility of renaming DC Stadium in honor of someone, someone worth honoring. President Johnson seemed to think, with no trace of irony that he was the best candidate. The stadium, as the president's thinking went, could be renamed LBJ Stadium, an enduring monument to his political legacy. Interior Secretary Udall and his coterie of former Kennedy aides, already enduring a difficult relationship with President Johnson, were not pleased with this idea and conspired to prevent the president from naming his own Taj Mahal. Examining laws governing naming of facilities on national parkland, Interior staffers discovered that the Secretary had full naming authority for such facilities, and did not require presidential approval or direction. Thus did Interior stall any action on the renaming of DC Stadium until the last possible moment, holding the president at bay. Finally, on Saturday January 18, 1969, with two days left in Johnson's presidential term, Udall signed an order to rename DC Stadium after his friend and fellow civil rights activist, Robert Francis Kennedy. DC Stadium would now forever be known as RFK Stadium. President Johnson was caught by surprise. Secretary Udall's staff had leaked the story to the press with just enough lead time to make reversing the event a political impossibility for the president in his final forty-eight hours in office. Coming just seven months after his assassination, it was the first major monument to the legacy of Bobby Kennedy's accomplishments as a politician. So no, if you thought DC Stadium was renamed RFK Stadium by the Redskins to honor the man for whom they had developed a grudging respect during the difficult period leading up to integration, you would be wrong. Or if you thought the District, a predominantly black city, renamed the stadium in honor of Bobby Kennedy's fight for racial equality for all, well you would be wrong there too. Nope, the stadium that became a hallowed football ground to generations of Redskins fans got its name almost arbitrarily, less to honor the namesake than to piss off his rival. Political Venue: The History of RFK Stadium continues tomorrow with part seven, The Stadium Becomes Legend. RFK Stadium: Dudley Brooks / Washington Post photo from here via here.